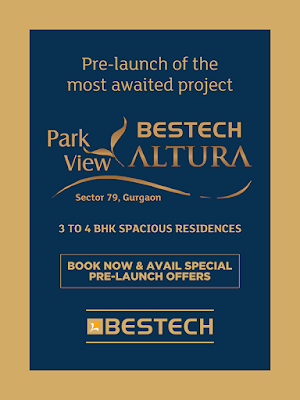 Bestech Group launching soon luxury group housing project Altura in sector 79, Gurgaon. The project offers 3 and 4 bedroom air-conditioned apartments with modular kitchen, chimney, hob, imported marble flooring etc. Situated in a prominent location in Gurgaon, Bestech Park View Altura is the perfect address for your dream home. This highly awaited residential project promises an urban lifestyle equipped with the best of amenities, finely crafted homes and high-end infrastructure. It is spread across ten acres of land with an array of modern amenities while offering 3 and 4 BHK apartments in different configurations. Being located in Sector 79 of Gurgaon, Park View Altura is at a close proximity to NH 8 and Dwarka Expressway intersection and enjoys good connectivity to nearby as well as Delhi NCR region. The project has been planned and developed by one of the reputed developers who are known for their quality work and timely delivery. Moreover, the locality is also equipped essential social provisions like schools, market places, banks, restaurants, parks among others.